To be an American R&B/soul singer means that from time to time an artist will be confronted with prevailing perception that those hailing from the birthplace of blues-based music have abandoned the genre, and that soul fans have to cross oceans if they want to hear authentic soul music. That must come as a shock and insult of artists such as the Atlanta native Toni Redd, who has released four soulful projects, including her latest, the very good Her Reddness. Redd certainly has the chops to dabble in the more hip-hop inspired production techniques that permeate much of contemporary R&B. Although her excellent last album, Catching the Redd Eye, contained some upbeat dance material and tracks that made nods toward more contemporary production techniques, the equally enjoyable new disc, Her Reddness, finds the sultry vocalist operating in her sweet spot as a powerful renderer of jazz-infused R&B ballads and mid-tempo love songs. Several tracks on Her Reddness could vie for the honor of being the lead single, and the tune Redd selected is the best and most radio friendly tack on a project that is filled with them. The funky and brassy “Treat Me Like a Lover” is a sensual challenge to give her what she needs physically, emotionally and spiritually. Redd could not have gone wrong had she selected “Underneath My Skin,” a track that finds the singer contributing her rangy and emotive vocals to a bass driven mid-tempo number that tells the story of woman trying to deal with the fact the her lover’s presence lingers long after he as gone, and she wonders if she has the same effect on him. “That’s The Way,” a cut that finds Redd pairing with saxophonist Kirk Whalum, is one of two strong collaborations featured on Her Reddness. The second is the “Time For Love,” a fun up-tempo duet that brings Redd’s friend and frequent collaborator Bobby Cheez James on board and allows two strong vocalist together to tell a story of two lovers enjoying each other’s company. Redd is a constantly evolving artist who, over her last two albums, has shown that there is plenty of diversity and life in a genre that those who do not know are too willing to cast as uniform and somewhat moribund. And while being an indie artist does limit performers in many crucial ways, it also provides artists with the freedom to explore and evolve while remaining true to their artistic vision. 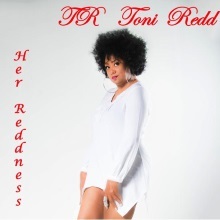 Fortunately for us, Toni Redd uses that autonomy to her full benefit on the very enjoyable Her Reddness, a terrific addition to her already strong discography. Highly Recommended.